Are you interested in doing research that makes a difference in the community? Each year the Department of General Practice has more than 40 students take part in one of our research training programs. We offer an outstanding environment to develop research skills with supervision and mentoring from world class primary care researchers and educators. Our students study within a supportive, collaborative environment and will be involved in regular team meetings and academic seminars. An active student led graduate research group provides a forum for peer support and development of practical academic and research skills. Regardless of your career stage, if you are interested in primary care research, we have an opportunity for you. The DGP provides supervision to students from Bachelor of Medical Science honours and Bachelor of Biomedical Science honours programs. An honours year is an opportunity to complete a supervised research project to identify and address a gap in medical research knowledge. The program provides you with a strong foundation in the principles and practice of research. You will be equipped with a range of skills including data analysis and oral and written skills for communicating scientific ideas and writing a thesis. A GP Academic Registrar Post provides exposure to research and teaching in an academic environment over a 12 month period on a part-time basis. At Monash University, you will be supported to develop your research and teaching skills as part of your individualised learning plan. You will receive supervision and training in research methods by senior researchers, develop your skills and confidence as an educator while teaching medical students in the 4th year medical program, and be mentored by an academic GP while participating in an array of professional and career development activities. 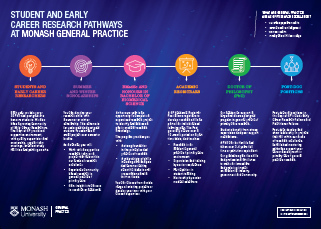 Our academics support a large and diverse postgrad program in general practice/primary care research. Students benefit from strong supervision and peer support mechanisms. A PhD can be flexible and taken over 3-4 years full-time or part-time equivalent. Our graduates gain the skills and professional attributes to make an immediate and enduring impact on academia, industry, government and community. For more information about research training opportunities in the Department of General Practice contact the Research Training Coordinator Dr Chris Barton.